The other day my friend Deena told me (that one of her friends told her) that with kids you could do all of the same things as you could do without kids — it just now takes twice as long, and is half as fun. I'm not sure about the half as fun part, but boy does the twice as long ring true. Last Saturday, I bartered a pan of cinnamon rolls for some overripe (but still sauce worthy) Yellow Transparent apples from Klee's Out on a Limb Acres. Standing out in the orchard, the baby resting in the shadow of an apple tree, chatting with Omer about things was just about the best way to spend a Saturday morning, and as I had suspected even before leaving home, I was inspired by the ripening orchard and came home with more than I figured on. All in all I've been pretty good this year about not over-preserving especially the sweet spectrum of things. But when my new orchardist friend was telling me about Dolgo crabapples, how beautiful the jelly is that they make, how he used to help his grandmother pick them for preserving and ate so many in their un-sugared tart state: I just had to get some to play around with. One smell of them sealed the deal. Then I ate one fresh from the tree. Though super tart, once my mouth was accustomed to it I could really taste how they could be transformed into something amazing, if not just eaten plain as Omer did as a child. They were beautiful looking as well, like near red balloons when freshly picked. As they sat around my house for a few days, they seemed to deepen in color. 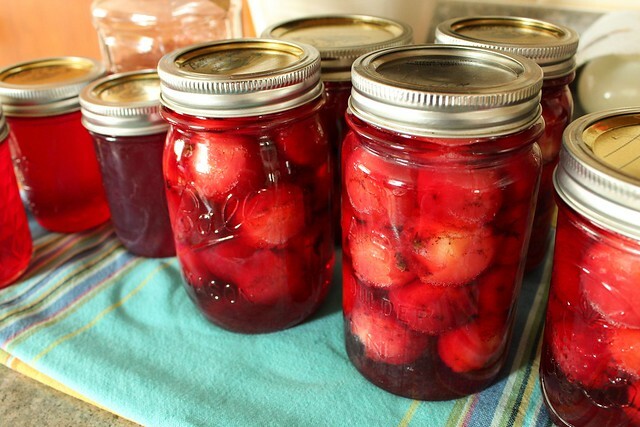 They infused the lot of my preserving this week with their cheerful bright pink. 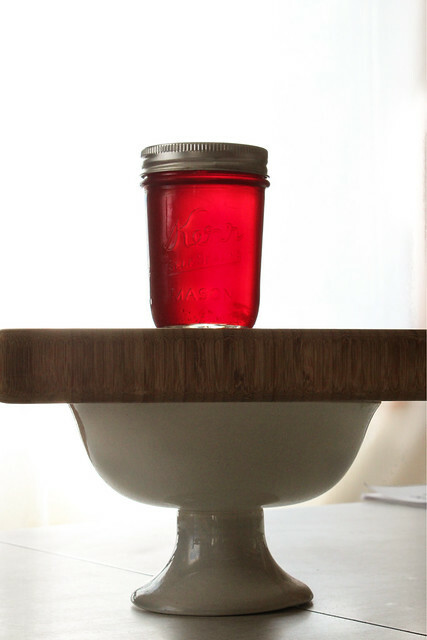 After getting home Saturday afternoon, I steamed down 4 pounds of them right away and let the juice strain for jelly. I'm quite sure I've never worked with a fruit with such a good amount of natural pectin, the juice was silky and thick, bracing to taste on its own, but really not unpleasantly sour. 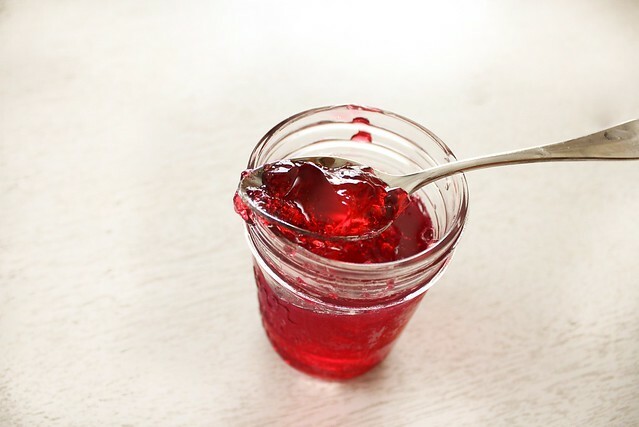 I got to making the jelly yesterday and got almost 4 half pints... I may have over cooked it just a little, but I'm not worried about it since the flavor is so good. 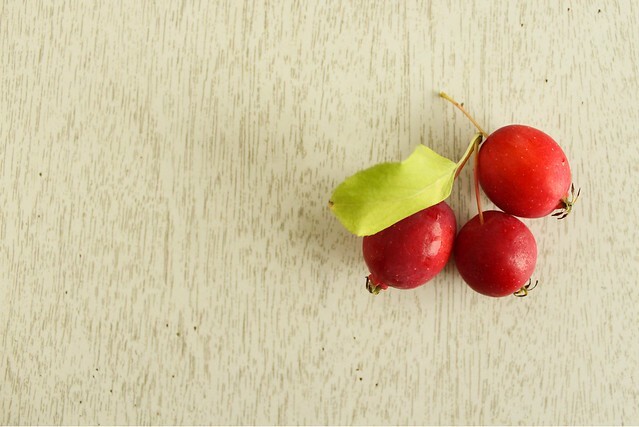 I still had quite a few crabapples left over, and I remembered my Dad saying how much he liked whole spiced crabapples that his grandmother used to can. Never having tried one, I tried not to remember the awful, fake red spiced apple slices that I'm sure I've eaten on more than one occasion at a Friday night fish fry with endless salad bar. I looked in my Ball book to see about that, and settled on a recipe that looked pretty straightforward and old-fashioned. I added ginger and used powdered allspice after there were no allspice berries to be seen at my co-op this morning. The result was amazing, just like I knew it would be... and not at all like those garish nibbles on the side of a Friday night salad plate. 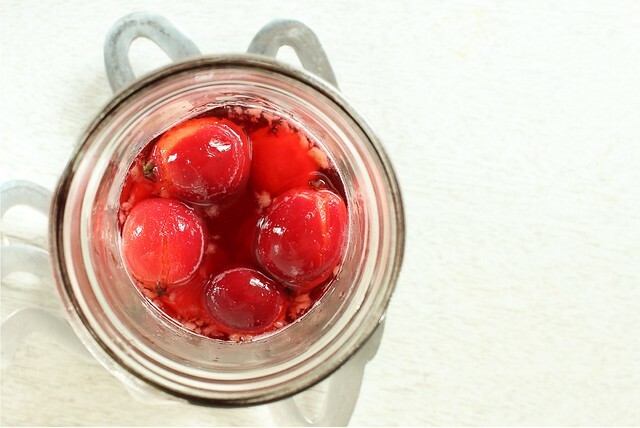 When crabapples are tender, use a slotted spoon to pack them into hot jars, leaving a 1/2 inch headspace. Ladle hot syrup into the jars to cover the apples, leaving 1/2 inch of headspace. Release any air bubbles and adjust syrup level accordingly. Apply lids and rings, and process in a hot water bath for 20 minutes. Remove the canner from the heat and let the jars stand in the hot water for 5 minutes before removing to a towel lined counter to cool completely. Before I had even tackled the crabapples, I made my year's supply of applesauce. Before a couple of weeks ago, I had never heard of a Yellow Transparent apple: so named for the pale yellow skin that looks nearly invisible. I found a website, Orange Pippin, that lists apple varieties, tasting notes, and other attributes, and found that the Yellow Transparents are a good bet for sauce. When I finally saw the apples in person, Omer explained that they are notoriously short lived, and when overripe, they can pop almost like a kernel of corn. First, he had me taste an overripe apple, which was mealy and lightweight for its size. Despite the negative marks against it, it did have good flavor, and when I then tried a perfectly ripe apple, I could see why people seek out this gem of a fruit. 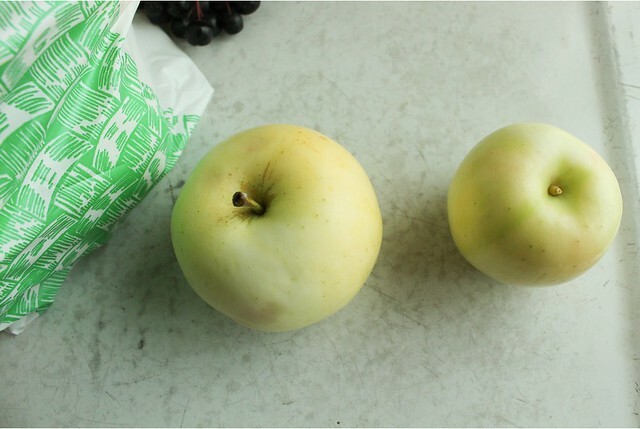 Overripe on the left, perfect specimen on the right. Fortunately, even the overripes were excellent for sauce. I added several crabapples to the pot as I started cooking them down to infuse the sauce with a little pink color; the extra pectin in the crabapples was just a bonus, and the finished sauce was sweet-tart and silky. I added no sugar. All told, I got 17 pints of applesauce, which I was very thankful for after not making any at all last year. Not bad for a pan of cinnamon rolls! 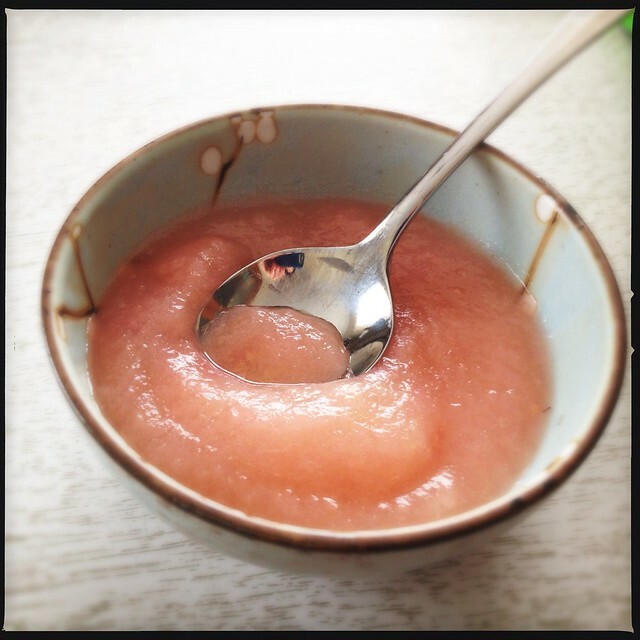 I had my older son help me turn the crank on my Gram's old Victorio strainer, and after all of the sauce was finished and resting we helped ourselves to big bowls full of still warm fresh pink sauce. So it's true it took me 4 days to work through what normally would have taken me about 32 hours or less, but it was still pretty fun. Estimating the newest boy's sleeping pattern sometimes worked and sometimes didn't, and having an extra pair of hands to hopefully learn a bit about preserving and to help in the kitchen was nice too. I sure hope both of my boys will grow up and be as excited as I am to see things growing and have the pleasure of preserving it!